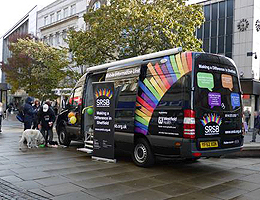 At Sheffield Royal Society for the Blind (SRSB), we are very proud that our clients, staff and volunteers come from all walks of life and as an independent local charity we could not function without the support of our volunteers, what they give and teach us all. We enjoy regular visits from international students who bring with them their culture and sometimes some unusual food and we enjoy discussions about our diverse world. 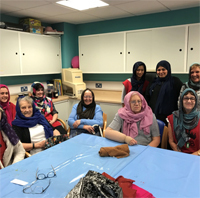 Very recently some of our Mappin Street clients asked two of the volunteers why they wore head scarves and why the style of them was so different. This lead to an interesting conversation that culminated in a “head scarf workshop” for some of the women in the group. Hafsa and Farzana, our young volunteers, were incredibly eloquent in explaining the reasons why they wear a scarf and the different traditions of tying: they felt truly empowered by the experience. The clients felt more informed and had a lot of fun with the different styles of scarf wearing. The session was so positive and full of laughter that we are planning to run it again for clients on different days of the week. Sometimes all we need is to ask a simple question.